Baby Daivy has ARRIVED! If you follow me on Instagram, you know that I had lots of prep to do before she came (as explained in this pic). I had “make as many freezer meals as possible” at the top of the list. I enlisted the help of my friend and the best cook I know, Shandra from Deals to Meals, to help…and BOY did she help! (at least) 31 meals, for only $100, in just 4 hours! My kids are young so it might be more like 15-25 meals for a family with older kids or teenagers. But still, that's a heckalotta goodness going on! Shandra is the mastermind behind the entire operation and recipes, so I can't take any credit. BUT…since you all went nuts about it on Instagram, I thought I'd share how we pulled it off. 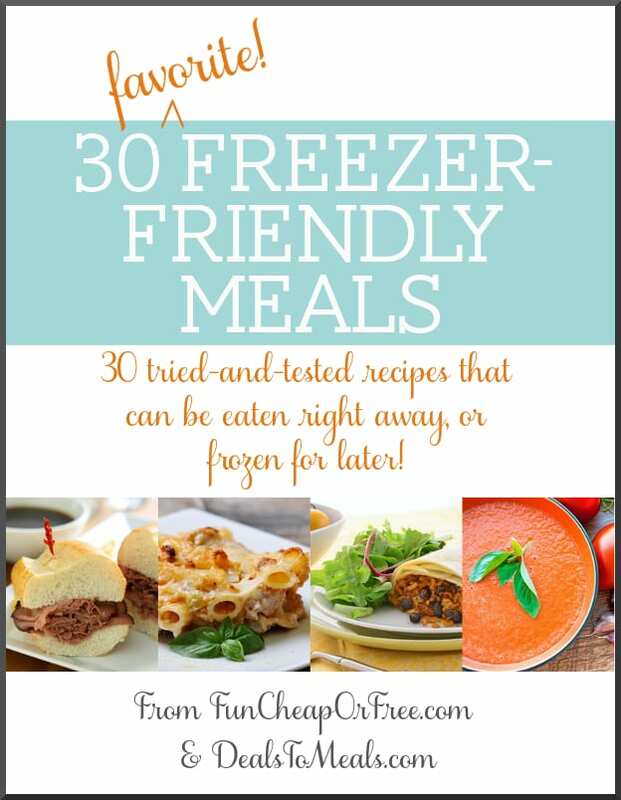 a 30-page recipe e-book of the best freezer-friendly meals that you can all download for FREE! UPDATE: Believe it or not, I have hit my maximum number of free downloads (over 30k!). I'm (sadly) unable to offer any more downloads for free. BUT…You can buy this entire Ebook today for the lost price of just $1.29; less than chicken nuggets! The majority of the proceeds go to fund my goal of traveling the country in 2016 to provide classes to YOU, in your HOME CITY! Additionally, a portion of the proceeds to go to help fight hunger through LDS Charities. So you'r not only doing your family good, but supporting me and doing good in your community as well! These recipes can be made immediately, or frozen for later. And trust me guys, they are UH-MAY-ZING. The misconception about freezer meals is that you would have to make 31 different meals in order to feed your family for 31 meals. Not true! Just pick 5-7 of your favorite go-to meals, double (or quadruple!) the recipe, and freeze them in individual or meal-sized portions so you can pull out what you need, when you need it. Simply rotate through the meals so you're not eating the same thing every time and voila! Easy, peasy, beautiful…feed you for months. I always make sure to have bags of frozen veggies in the freezer that I simply steam in the microwave. So between the veggies and the freezer meal, BAM. Dinner is served. Lasagna – 4 HUGE pans. Each pan will probably feed us for at least 3-4 meals (12-16 meals total). Hind-sight, we could have used smaller pans and made 8 lasagnas, feeding us for 2 meals each. But these will be handy for when we have company over and I don't want to slave in the kitchen all day. 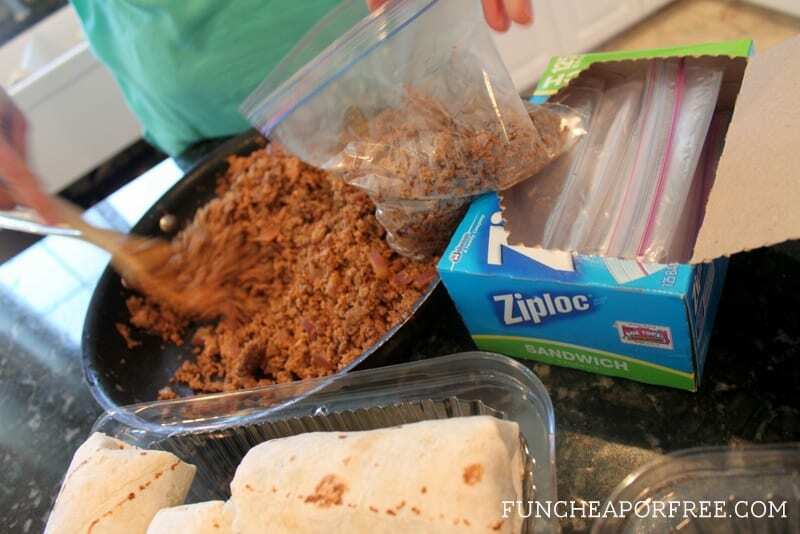 Taco meat (for tacos, taco soup, ground beef enchiladas, burritos, taco salads, sloppy joes, etc.) – 4 pounds, and I tend to only use 1/2 to 1 pound at a time when cooking, so that's at least 4 meals for us. 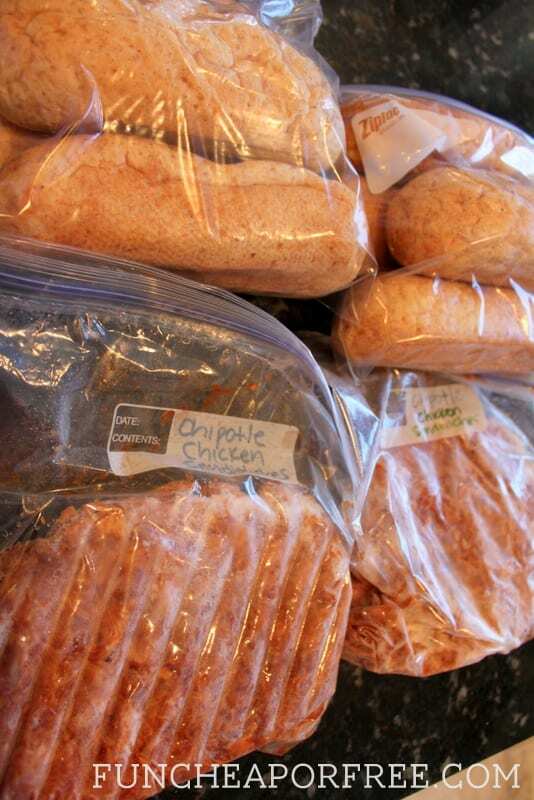 Chipotle Chicken Sandwiches – We froze 2 huge gallon ziplock bags of meat, and 3 bags of large hoagie rolls (about 15 sandwiches total) which would feed us for at least 4-5 meals. 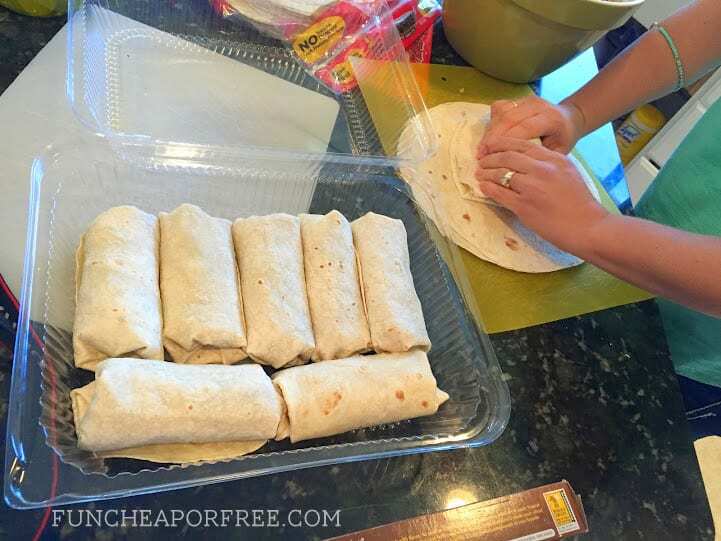 Southwestern Burritos – we made 34 (stuffed to the max!) burritos, and still had enough filling for another 5 more (ran out of tortillas). My family would probably only eat 3-4 burritos in one sitting so that equates to at least 8-9 meals for us. My husband has deemed these great grab-and-go meals, much better than store-bought frozen burritos. We will often microwave a few and eat them in the car on the way to an outing, or he'll toss one in his work bag for lunch. Super versatile, SUPER yummy! 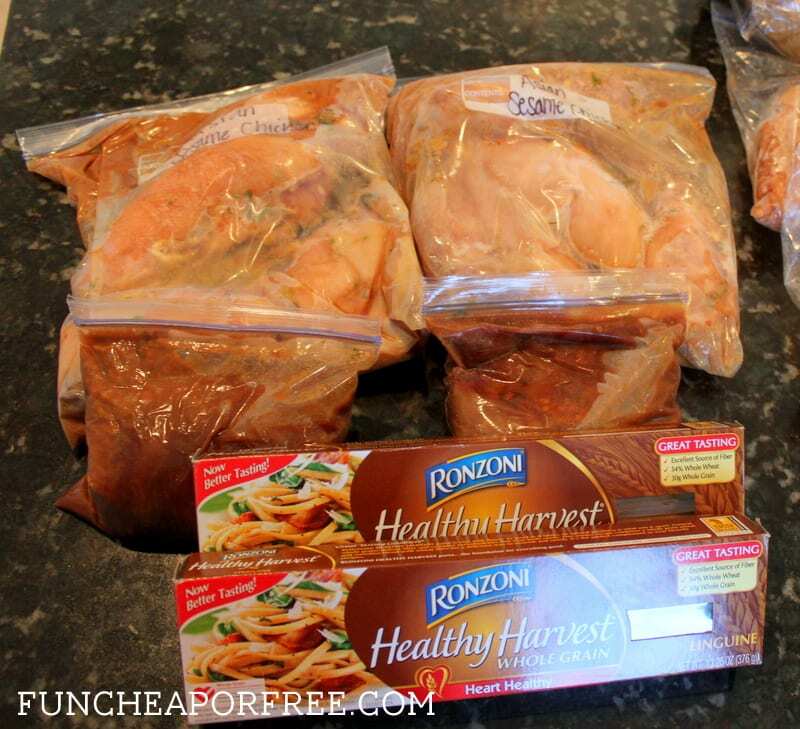 Asian Sesame Chicken – 2 Large bags of chicken, 2 bags of extra marinade to dress the chicken, and 2 boxes of pasta for the chicken to go over. Each bag/box would feed us for about 3-4 meals, so that's at least 6 meals. We tried to be conservative on our final number, so we are aiming low and saying these meals could feed us for at LEAST 31 meals. Again, our kids are young and don't each much so we could stretch these farther than a family of 5 that has teenagers. But still…even if you only got 20 meals out of our 31, that's still amazing! If you've been reading my blog for longer than 2.3 seconds, you know I've been obsessed with Deals to Meals for years (that's how Shandra and I became friends, actually…because I stalked her blog for so long!). Their website scours the ads for the grocery stores in your area, then puts their best deals for the week on a spreadsheet, highlighting any FABULOUS deals in red. I basically go through the list, add anything in red that I'm in need of to my shopping list, print it out, then take it to Walmart to price-match (since they match anyone's advertised price within 30 miles of me) which saves me about 1/2 on my groceries each week. To see full details on how I grocery shop see HERE. (If Walmart isn't an option for you, you can just find the store with the best deals that week and shop there and you'd save just about as much on your shopping.). She also gives you complete meal plans with recipes each week (including sides, main dish, and a dessert!) that help use up the groceries that are on sale that week. Really, it's amazing. Check Deals2Meals out HERE. So that's how we got all these groceries for just $100! As for the freezer pans, I get those from the dollar store (see what to buy and what to avoid from the Dollar Store HERE). First of all, I had to make room in my freezer! See how I inventoried and organized my freezer HERE. Shandra spoiled me and prepped much of the food before she came over. 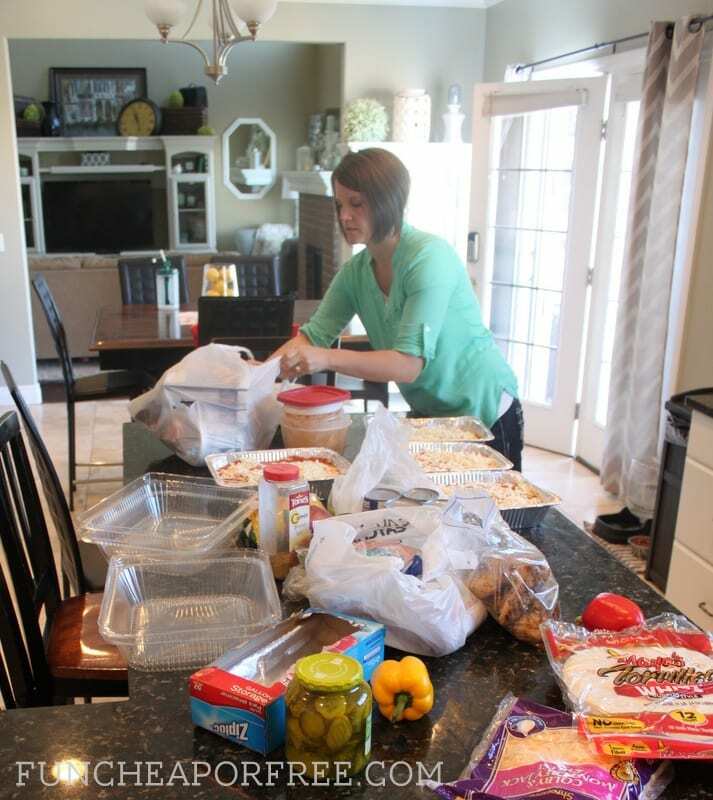 She said the prep took her about 1-2 hours at home, but she bought the same groceries for her own family meals that week and simply prepped them all at the same time…so it probably took her longer than if she was just doing freezer meal prep only. 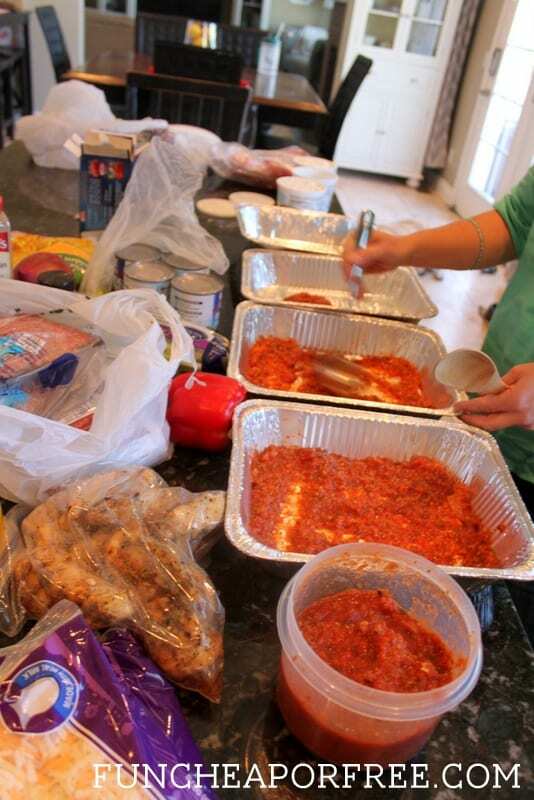 Together, we created an assembly line and assembled the remaining meals. It took about 2 hours start-to-finish at my house (with lots of chit-chat that slowed us down, but was well worth it of course). 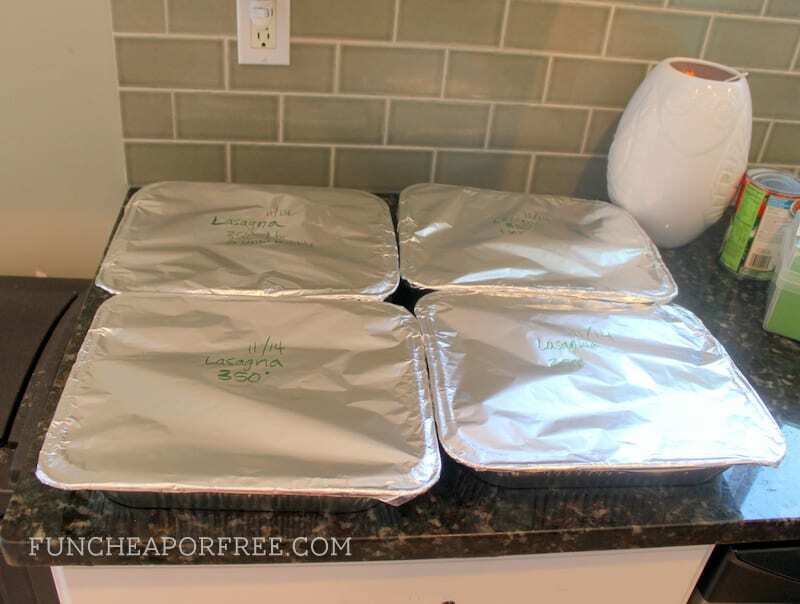 Add that to Shandra's 1-2 hours of prep time, and it's pretty amazing that we got over 31 meals completed and frozen, for just $100, in only 4 hours! I'm still a bit giddy about it. This isn't as hard or as complicated as it looks! You can do it, I promise. Freezing meals is a GREAT way to save you money in the long run, because it will bail you out on those days when you're tempted to order takeout. 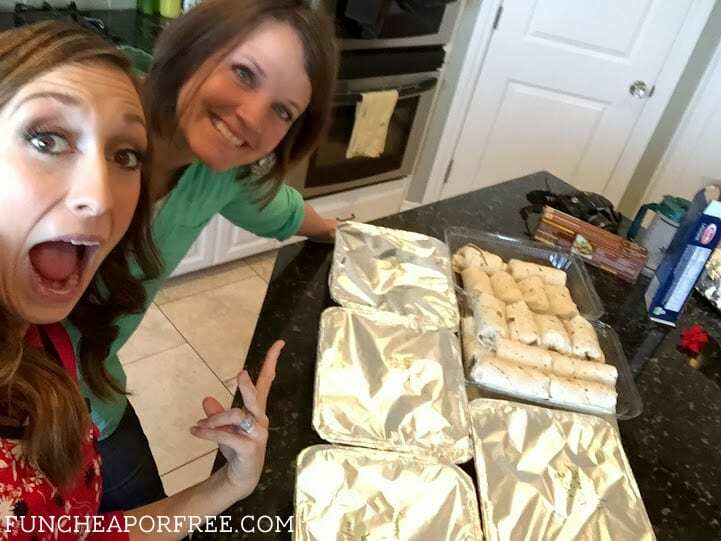 Grab some girlfriends, get an assembly line started, and make a fun day out of making freezer meals together! Now…how do I get that 30 page freezer meal recipe Ebook?? Again, 100% of the proceeds are going toward my fund to travel to YOUR home town to teach classes to YOU, as well as fighting hunger though LDS Charities. Thanks for your support! UPDATE: Check out my latest Ebook, 81 incredible Slow Cooker Recipes while you're at it! Wheew! Sorry for yet another megapost. But I hope this showed you that by taking a few hours (and enlisting the help of a talented friend) you can feed your family for MONTHS, for pennies on the dollar. Only 37 days until MECCA madness!! I’m not a commenter, but this is awesome and very timely! Thank you to both of you! I do not see a shopping list. Is there one? Was I missing the shopping list? I bought and downloaded the 30^favorite Freezer Meals, but there isn’t one SHOPPING LIST for all items needed to complete the recipes in one trip. Did you cook the lasagnas? Or do you freeze them, thaw them, and then cook them to melt the cheese later? Great question. I cook the marinara sauce (or just use bottled spaghetti) but then keep all of the other ingredients uncooked. I use the no-bake lasagna noodles so that preparation of the lasagnas are easier. Just thaw and then bake for 35-45 minutes at 350 degrees, or until golden brown on top. Hope that helps. I’ve been wondering about using the no boil noodles for freezer lasagna! They taste just as good as fresh? If so, sign me up! Boiling, drying, etc is for the birds! I was worried they’d get mushy or something odd …. If we already subscribe how do we get the freezer meal recipes? I tried entering my email and it says invalid email. Thanks! Can’t wait to see more! I subscribed to your newsletter and am looking forward to it. I did not get a pop-up for the e- book on my iPad. Please include a link in the newsletter. Thanks! I also signed up to follow you and the link didn’t pop up. I am excited to have found your site and look forward to seeing all your great ideas! This looks so awesome. I couldn’t get the recipe e-book either. Can’t wait to get to it. I can’t get the link to work….not sure if I’m already a subscriber or not but when I click the link it takes me to some ad page. Thanks! And congratulations on the new baby!! Oh shoot, sorry about that! I have fixed the problem and it should work just fine now. Thanks for letting me know! Oh no! Email alisha@funcheaporfree.com and she will help you. Where in the world on this site, do you order this free Freezer meals? And do you have to pay shipping? You get the recipe book for free, unfortunately there’s no offer for actual physical meals (though that would be amazing!). Just read the post and at the bottom it will tell you how to get the free e-book of recipes! Thanks for reading! This is awesome! I am so glad I came across this on Pinterest. I like doing freezer meals, and these are ALL things my family would eat . Thank you!! I also subscribed to Deals to Meals. I can’t wait to get started! I’d be very interested to see your take on this! Could you reply with the working link? I am gearing up to stock the freezer while we are on break from homeschooling and these look great to add to the menu. I had to laugh at the number of meals you get out of them though. I remember those days fondly but now I have 4 teens (all boys) plus 21, 11 & 9 yo girls and 6 & 4 yr old boys. It looks like we could get about 10 meals out of this and maybe 1-2 more by combining left- overs. I try to stay at 10.00 or less per meal so this works for my budget and the recipes look like ones that most of my family would like (not easy to do with so many taste buds to please). I am already a subscriber to the newsletter (which I really enjoy), but do not see where I can download the cookbook. I couldn’t download the book from here, but I copied the link and opened it with another browser. I downloaded the book and opened it with Google Drive. I’m glad you got it figured out, thanks for sharing! Hi there! Love your site. I’m new here and am just sitting down with my plans to do some freezer cooking today. I had a question about your Southwestern Burritos. The original recipe says I cook them, but the freezer option states I can freeze just the meat portion for later OR roll them up and freeze them… but nothing about cooking them. Can I cook them according to the original recipe, allow to cool, then wrap them up to freeze? This way they can quickly be a grab-and-go lunch option? Or will cooking them first make them more difficult to wrap for freezing? And if I can cook first, will they be too mushy when thawed first and then microwaved? I know it’s a lot of questions, but I’m just not sure. Perhaps I’m over-thinking this. I’d just hate to prepare this for lunch/snack options when they really should be a larger meal option. Great questions! The beauty with the burritos is that the meat is already cooked! We did grilled chicken in ours, and nothing else NEEDS to be cooked. So to microwave them is essentially just heating them through, not actually cooking anything. Baking them is just a taste preference for when your’e ready to eat them! So you’re good to go either way!! Thank you so much! I told my husband about these and he’s really excited to try them. I think I’ll experiment with some baked and some not, just to see which way works best for us. Again, thank you for your help and Happy New Year! I stumbled upon your blog from Pinterest, and have spent the last hour or so reading and planning to *try* my own freezer meal day. I’m hoping that cutting the recipes in half or thirds will work for me since I’m only cooking for 1. THANKS so much for all of the posts-love the debt/finance ones too! Hi cute Jordan! I already get your emails so how do I download that book?? Just put in your email address (even if you’re already on the list) and the link will pop up. Let me know if you have any problems, thanks!! I Have Access To The Link, But It Won’t Load Properly. Any Suggestions? Weird! I will email it to you directly using the email you provided with your comment. Thanks! 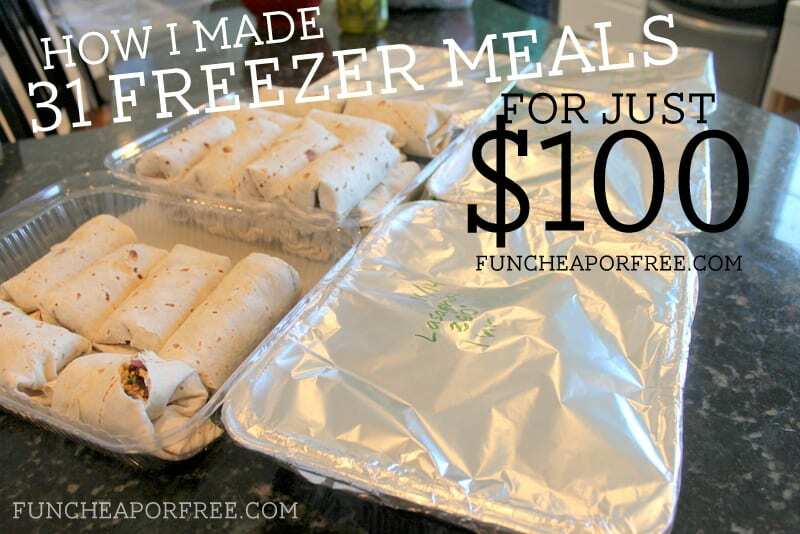 I’ve tried freezer meals before and I LOVE THEM !! You have an awesome collection of great recipes I can’t wait to try. Just a suggestion but on the last page of your E-Book you should add a shopping list if you want to cook all of them at once like you did here. That would be great to have! Looking forward to grocery shopping this week and doing some meal prep. Your blog is amazing and full of great ideas and delish looking recipes. Can’t wait to see more! Love that suggestion, thanks Julie! Most of the recipes we doubled. The lasagna recipe actually made a couple more than we first thought, because the pans were smaller. Doubled amounts should give you several meals for each 😉 Each recipe serves 4-6 people. Can’t find shopping list ??? Takes me to page not found ??? I was wondering do you have a shopping list? Also how many servings/people do each meal feed? If I missed that part my apologies! Such a great blog thanks for all your post love reading them!! There is no shopping list yet, but let me see what I can do about getting one together! Is their a shopping list yet? Hi! So did you double up the recipes that are in the book? and how many times for each recipe? this is so helpful! ( : Would absolutely LOVE a shopping list! after the baby comes. Curious how breast feeding went after eating these freezer meals. Did baby handle all the food ok, or would you recommend avoiding certain dishes/recipes while breast feeding a newborn? TIA! How did you reheat the meat you cooked prior to freezing? Sometimes reheated meat has a funny taste- not fresh at all. Do you have suggestions on how to properly reheat it? All of these recipes I have not had a problem with the re-heated meat tasting funny. I usually just warm up the meat in the microwave or on the stove. If it’s an item like the Southwestern Burritos I would put those in the oven to bake. You can always microwave on half power so that it doesn’t over cook the meat and just warms it up. The recipes like bbq shredded chicken could also warm great in a crock pot. Good luck to you! I’m so excited to try some of these recipes this week! But I also was wondering how you reheat the meals out the freezer to eat. I’m new to making freezer meals, but when I tried it once with leftovers I had the worst time trying to thaw it out of the ziploc bag and then get it warm. Help! I am also curious about the re-heating prior to cooking to eat process. I didn’t see any instructions for such in the recipe book so I wondered if you reheated some through a crock-pot/stove-top or used the microwave or oven to thaw then cook, or if it was straight from freezer to oven type of cooking for some of the meals. Any info on this would be great! Looking forward to giving this a shot. I’m so excited to try the recipes in your e-book, but I had a quick question. It looks like a paragraph is missing in your baked ziti recipe. How long are we supposed to bake it? And how did you assemble it in the pan? Thanks so much! Is there a shopping list for all this. Also do you have any recommendations regarding making there for one or two people. Hey Kaela! There’s no shopping list, sorry about that! Hey these are great recipes! I was just wondering if you cooked the noodles first in the Baked Ziti recipe, I’m new to freezing meals and not sure what step to stop and freeze at. Thanks so much. I would like a copy of your freezer meals but I tried both btbednarik@q.com and gardenbednarik@gmail.com and it said that the email address were invalid. What can I do? Sorry about that! Email alisha@funcheaporfree.com and she can help you! I’ve been looking for meal planning ideas and have yet to find one I like until now! The fact that you include recipes as well, omg you’re a life saver! Thank you so much. I love this concept but I am always a little bummed that I can’t just copy what you did. I have to eat gluten free and a lot of freezer meals are sadly not possible for our diet. I would love a gluten free post sometime or even a ” how to save money at a health food store” post. Many of the recipes can be adapted with gluten free bread, corn tortillas, etc. I’m not gluten free but many of my friends are and from what they’ve said there are some pretty good options out there. Ill definitely do a health food store post, thanks for the feedback! Great post! I noticed in one of your pictures that you have a lot of Lysol wipes. Im going to be the crazy Norwex lady and ask if you’ve researched how toxic those are for your families health? Norwex is a great solution for cutting those chemicals. Check out my website if you want to know more. Sorry for being that person! Thanks for the great post of meal ideas!! 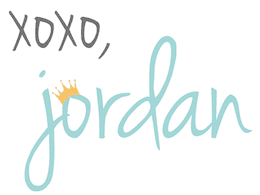 Jordan, Love your blog and have been subscribed for sometime. I would like to receive the e-book but I am already subscribed. How do I get the e-book without resubscribing? 15 years? Gmail email addresses are free, maybe you could sign up for a new one! Email Alisha@funcheaporfree.com directly if the problem persists. Hi! I downloaded your e-book and noticed on the Baked Ziti recipe that it doesn’t say how long to cook. I assume it’s 30 minutes? Oh no! How did I miss that?! Sorry about that! Yes, 30 minutes or until bubbly and warmed through. I am just starting to do this for my family. Thanks for the great ideas! You feed your family of 5 off of 1 pan for 3 to 4 meals? Those are absolutely unrealistic proportion sizes! Haha yes most likely for other families! That’s why I explained that it would be less portions for a family who doesn’t have as many young kids as we do. We have 4 kids now, but the oldest is only 5 so combined they only eat 1-2 adult-sized portions between all of them. So you’re absolutely right, it would be far less for a family with bigger kids! But the recipes are all pretty hefty and can feed a large family well, since Shandra has 6 kids, some of them teenagers. Thanks for reading!! 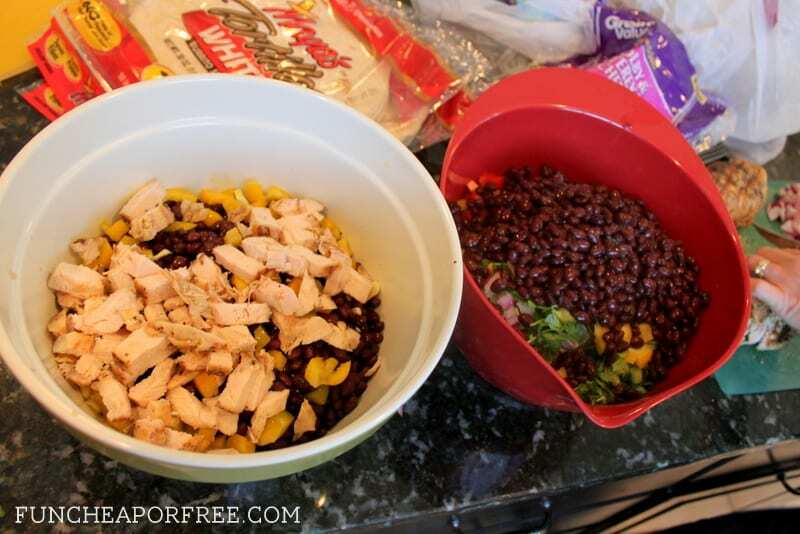 If you doubled the recipes, did you really make that many burritos with only 2 chicken breasts? I am trying to figure out a shopping list and need to know how much to buy for this recipe. it doesn’t say anywhere how many burritos the standard recipe makes. Help! Yikes! I’m sorry, it’s not my original recipe so I can’t vouch for it entirely. But I will say if you plan to double the recipe, than double the amount of chicken she says. The burritos definitely had more “filling” than chicken in it – the chicken was a nice protein bonus, but wasn’t the star of the show. So I wouldn’t be surprised if there were only a few large breast pieces in there. You could always email shandra@dealstomeals.com with more questions! Thank you so much for the quick answer and for the wonderful ebook! So, now that some time has gone by are you happy with the meals and quantities that you chose? If you did it again, what would you change? This is an awesome e-book, Jordan! Thank you so much!! There is only my husband and I most of the time here, but I have to eat a very restricted different diet now. Making all this at one shot and freezing it (I’ll do it in smaller amounts so he gets one dinner and one lunch to bring to work out of each) makes it so much easier for me. It means I do not have to cook tempting food I cannot eat Every Day!! It also means I don’t just give him a sandwich because it gets old cooking 2 separate dinners every night!! My only problem is I am having trouble making up the shopping list!!! I know you said there was not one, but you did mention that you may be able to do something there. Any chance you can actually make one with all you have on your plate (so to speak)?? Or should I just muddle through & try to get it right…I had a stroke a few years ago and I am afraid I am just not as sharp as I used to be!! Thanks for all your wonderful posts!! There’s no shopping list!! Let me see what I can do! Did you get a shopping list by chance? Ok, so do you have to thaw each recipe before baking? I don’t see instructions to bake straight from the freezer for most of the recipes. This looks amazing! I subscribed but when I tried to enter my email address to get the ebook it states that my email address is invalid. Shoot! Email me jordan@funcheaporfree.com and I’ll get it to you. I’m ready to join your Awesome Group! I’m not sure if I’ m doing this correctly . Do I simply make a comment and then I’m In or do I submit my info . Please bare with me. I’m Not as TechSavy as some. !!!!!!! OKAY I see a subscribe Icon at the bottom. Maybe that’s IT! What’s the recipe for the southern style burrito? The recipes look very tasty. Instead of freezing a whole lasagna I make lasagna rolls-ups. I follow my recipe for my lasagna roll-ups up to where it tells me to place the roll-ups in the baking dish. So I cook the lasagna noodles and make my filling. Then I roll up the cooked lasagna noodles with my filling and place on a cookie tray lined with wax paper. I place that in the freezer (uncovered) until the roll-ups are just frozen. Then I place those frozen roll-ups in zip lock freezer bags. I have them freeze uncovered before placing them in the bag so they don’t stick to each other or the bag. When we want lasagna, I pull out just the # we need, let thaw in the refrigerator and bake as recipe calls for with my sauce and cheese. Hm that’s weird – email alisha@FunCheapOrFree.com and she’ll get you a copy! Did you cook the chicken breasts before freezing for the Asian Sesame Chicken? Did you put them on skewers or grill them whole? Thank you. I am trying to purchase the ebook, but everytime I try, it says it is invalid. I am certain I entered my card information correctly. Any ideas? Sorry about that! Some browsers are having issues. I’ll send your email and content to service and they will be in touch! Hi, I have tried to download the book several times, but I cannot find the download. I put in my card information and got confirmation, but it never downloaded. Any suggestions? I’m using an iPad. Sorry about the hassle! Email support@paywithscratch.com and we will get it to you asap! I am curious if everything can be heated in the oven. We don’t have a microwave and don’t plan to use one. So it’s been a bit since you did this and have probably eaten it all by now. How were they? I am looking to do some freezer meals (I’ve done lasagna, chicken pot pies and a few others that have been great in the past) but I tried doing some freezer bag meals I found on pinterest, got it all put together and frozen then when I went to cook them they were just not good recipes at all and my family hated them! I told myself then to be cautious with freezer meals find because some aren’t always as good as you think. Anyhoo. I’ve been following for a while now, have with similar ages and trust your opinion. Did you like them all? Is there any you wouldn’t make again or make more of next time? Thanks! Thanks, I’ll be trying them soon. I probably should have done it with the first batch I did. But lesson learned. Don’t believe everything that pinterest tells you and try recipes BEFORE you make them in bulk! I have order this book. The money has deducted out of my account but I haven’t gotten an email or a link to get the book. What do I need to do? Oh no! Some browsers are having trouble, sorry about the issues! email support@paywithscratch.com and they will get back to you asap on that. I’ve been trying to download the e-book because I totally love all the ideas. It keeps charging me every time I try to download it. How do I get it? I tried buying/downloading your emenu thing and it took the money but didn’t download. Sorry about that! some browsers were having issues. Email support@paywithscratch.com and they will get it to you right away! Hi! Is there a grocery list that come along with the recipes? And shows how many it will feed? I purchased the cookbook and love all the recipes in here. My friend and I are making freezer meals today, and I’m wondering if we should cook the chicken for the Asian Sesame chicken first or if we should just freeze it with half of the marinade. Thank you! Love the post! But can’t find the shopping list or open the link to the ebook. Thank you! I had originally down loaded the free book and loaned out my favorites and never got them back. I decided to order the ebook but it says it no longer is available. Hi! So I’ve tried every browser I have: Firefox, Chrome, Safari plus Chrome & Safari from my phone. Each time I enter my information and credit card info and click “create account” in order to be able to pay $0.97 and download this ebook it jut refreshes and I’m staring at the same fill in form but blank. I’ve read the comments and this seems to be a big issue for you. I know $0.97 isn’t much but for every person who commented about having trouble *giving* you money there are probably 50+ more who just give up and move along. Can you tell me how to pay for and receive the book? I’d also suggest getting the woocommerce plugin for your wordpress blog. It’s easy to set up and works awesome for selling digital downloads OR physical products. I’m sorry for the trouble! There were issues initially but we were able to smooth them out for the majority, there was a bug that needed fixing. But as you’ve learned, some are still having issues! I’ve sent your information personally to support@paywithscratch.com and they will get you the book asap. Thanks for your patience! I was very excited to purchase this but I can’t! Every time I click to purchase half a blue/green screen pops up but nothing else. I’d really love a solution to this so I can start using it. Oh weird!!! I’m sorry! Maybe it’s a popup blocker thing in your browser?? Email support@paywithscratch.com and they will get that fixed ASAP!! I just emailed them for you using the email you submitted with the comment, just FYI. Hi I just paid for the download but haven’t received a copy? A big blank came up its gone through my credit card, but no download? Hmm…maybe your browser is having an issue? I’ll forward this to support@paywithscratch.com and they will take care of you! Very interested in your book but can’t get the link to work. This is the first freezer meal blog that actually looks like food my family eats!!! Freezer meal book doesn’t download. Is this a scam? It’s worked for tens of thousands of people, it’s definitely not a scam 🙂 Some browsers are having issues, mostly because of pop-up blockers and such. We are handling each issue personally, so I’ll send your info to support@paywithscratch.com and they will get back to you asap! The links aren’t working (could be that I’m reading this on Pinterest) but I’d like to buy your book. Could you email me the link to purchase it? Oh weird! Sorry it’s having issues. Let me send your issue to support@paywithscratch.com and I’ll find a new link to update in the meantime! Can I get the link to buy you book. I definitely want to try this. Hmmm I wonder why we’re having issues all of the sudden! I have my programmer looking at it asap! In the meantime I’ll have them manually get it processed for you. I’ve emailed your comment and your email address to support@paywithscratch.com and they will get it for you asap! Well, the book of recipes is only $1! But yes, I paid $100 for all the ingredients that made 31 different meals. Sorry you’re having issues! A few browsers aren’t loving the links for some reason. I personally sent your message and email over to support@scratch.com and they will get back with you asap!! I paid for this and download would not load????? Sorry about that! Some browsers have issues from time to time. I sent your issue to support@paywithscratch.com and they will get it to you asap! Sorry about that! I’ve personally sent your issue to support@paywithscratch.com and they will get it to you asap! This is the kind of cooking I need to do for my family! I have 3 sons and a husband who eat CONSTANTLY. So awesome, easy, and delicious recipes are exactly what I need! Are there any alternatives to the plastic and foil since both are known to increase the level of toxins we consume in our food? Yup use whatever you’d like! Hey! I bought the ebook, but it won’t let me download. It says invalid format 😕 I’d love to get a copy and make these meals! Thanks! Ok I’ll send your info to support@paywithscratch.com and they will get it to you! Just purchased the book and my phone shut down and didn’t get to save it. How do you get to it? Just email support@paywithscratch.com and they’ll get it to you! I paid and it won’t download. Hi Joyce! Just email support@paywithscratch.com and they’ll get it to you! Hmm…if you email support@paywithscratch.com they can help you with it! I downloaded the book a couple of weeks ago and have made several of the recipes. We love them! I have found that NOT cooking the lasagna noodles and using regular ones (not the no cook ones) give you a much better texture in the end result. Thank you so much for this great little ebook! You have saved this momma a lot of work during her busy week. All you recommend is animal flesh recipes. I found your post on pinterest at vegan meals and I am so disappointed to find this page with all recipes containing animal flesh. Yuck! I just downloaded the book and am making my grocery list as we speak but noticed there are not servings listed for each meal…about how many servings are there per meal? This will help me choose, as I want to make the ones that will last longer. Thanks! I just found the serving comment in a previous post, 4-6 per meal thanks! I purchased your eBook and it is reflected on my scratch dashboard, but when I went to click the “download” button, nothing happened. I just purchased this e-book. Is there a shopping list yet? There doesn’t seem to be cooking instructions for the frozen version of the meals. How do you adapt the baking/cooking instructions if you are fixing from frozen? Purchased book…would not let me download…is there a link? Maybe your browser is having issues. We will send the problem to support@paywithscratch.com and they will fix it asap! I have the same question as Becky above. When you have frozen these meals and are ready to cook them, do you need to thaw them in the fridge first, or can you cook them from frozen? I am a total freezer meal noob! Help! I rarely thaw them! I will pop them in the oven as it is preheating usually, or I will just stick them in totally frozen! Just adjust time as needed. Is the .97 a one time fee for the book? I am really excited to use these recipes! Yes it is! Hope you enjoy!! I made payment, but I don’t see the ebook. Can this ebook be downloaded to an Ipad? I will send your concern to support@paywithscratch.com and they will take care of you! Hi, I just bought two ebooks 🙂 where can I go to view them ??? I’ll forward your inquiry to support@paywithscratch.com! 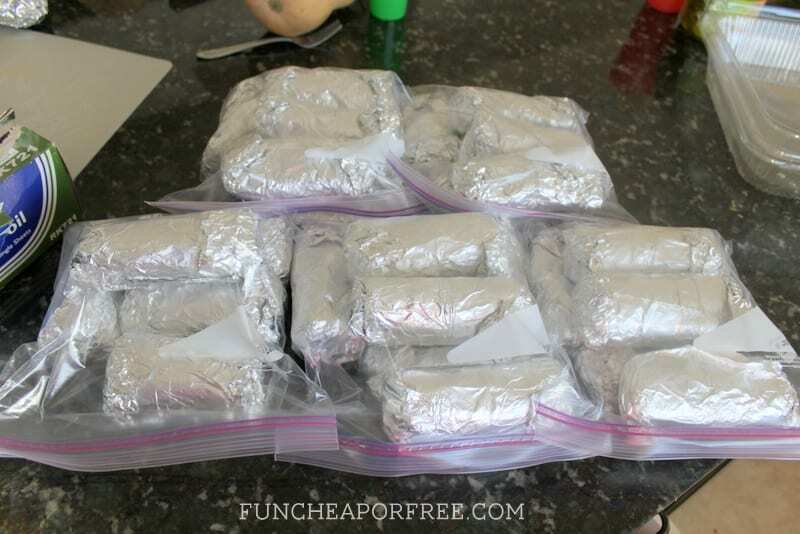 With the southwestern burritos do you bake them before freezing? Oh Poo! I missed the Free Version lol. Is this working now so we can get to it or are they still having technical difficulties? 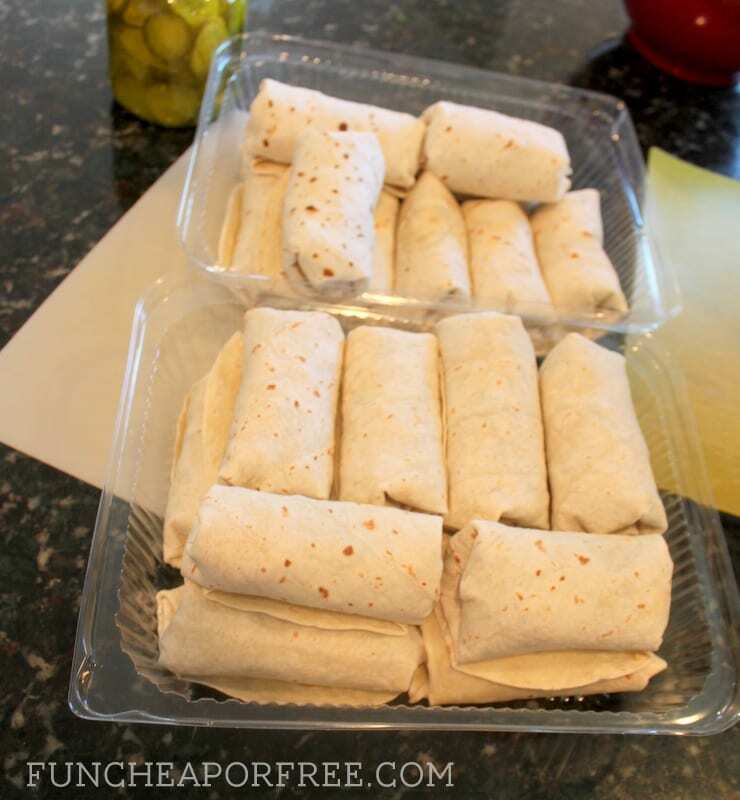 For the Southwestern Burritos, how many individual burritos do you get with 1 recipe? And what size tortillas did you use? I want to make a whole bunch of them and freeze them for on-the-go meals, but I’m not sure how much ingredients to buy. Thanks!! I have been trying to purchase the ebook and it’s not letting me finalize. Please let me know what I can and do to fix this. 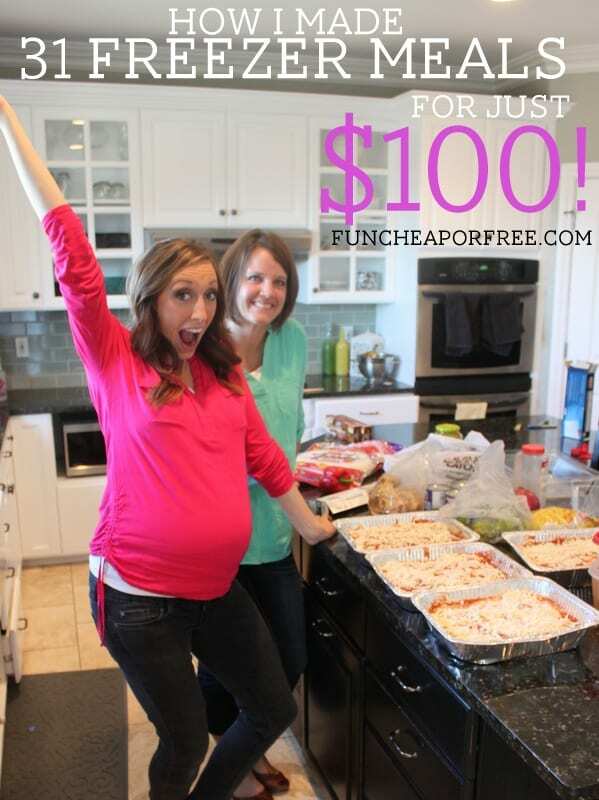 Email alisha@funcheaporfree.com and she will take care of you! I love this one. We try and do huge freezer cooks so that week night meals are easy and planned. Been several years now and still never received my ebook….. I never got a copy of the recipes.It was just before your rexburg trip. Just email contact@funcheaporfree.com and we will take care of you! Erin, sorry you are having issues. Can you email Contact@FunCheapOrFree.com and we will see what is going on. Thanks!